Samarian town of Nof Ami wants Israelis of all ages to come and celebrate the "snow fun" with them - complete with wintery treats. With snow falling in Israel Thursday, and even more predicted for the weekend, the thoughts of kids throughout the country turns to snowball fights, sledding, building snowmen, and more snow fun. 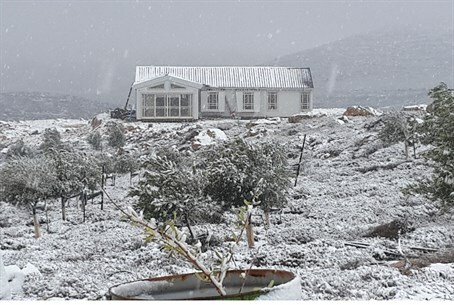 It's time for a snow party – and the Samaria town of Nof Ami wants Israelis of all ages to celebrate with them. Nof Ami is a new community in the Shiloh Bloc (Gush Shiloh), near some of the highest hills in Samaria, and already early Thursday found itself blanketed with the white stuff. Residents, realizing they would probably have an influx of visitors, began preparing for “snow tourists,” preparing hot soup, cocoa, and other wintry treats. Nof Ami is named for IDF soldier Ami Mishlomi h”yd, killed in the Second Lebanon War. Located at the far eastern end of Gush Shiloh (next to the town of Kida), Nof Ami offers dramatic views of the snow-encased Samaria hills, as well as the of the Jordan Valley and the Hills of Moab over the Jordan River, where snow has also fallen.